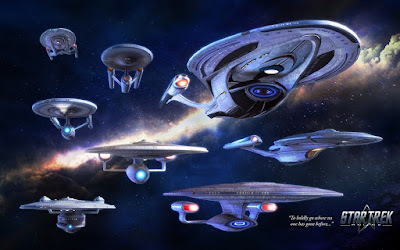 I watched every new beginning for Star Trek since "Encounter at Farpoint" first aired on BBC2. I was a wee 6-year-old then, but I still remember running across the room, my arms looped in a childish facsimile of the starship Enterprise, in time with the opening theme (must've driven my family mad). Then I watched "Emissary" on Sky One as a somewhat cynical 9-year-old, who initially lamented about a Star Trek that didn't have a spaceship to go off and Explore Strange New Worlds, before being taken in by the station's distinct appeal. I was an 11-year-old bona-fide Trekkie when me & my family got together to watch "Caretaker" when it aired here: Star Trek was arguably at its peak media saturation, with three distinct crews across film and television. Between then and the return of Trek to television in "Broken Bow," I collected the Star Trek Fact Files, amassed a collection of Star Trek games, was fluent in technobabble, fought ruthlessly in The Eternal War, and was in the final four of a quiz at Glasgow's Contagion Star Trek convention one year. And every single time, for every single new beginning, fellow Trekkies asked: has Star Trek lost its way? First TNG dared to be Star Trek without the original ship & crew; then DS9 dared to eschew the very concept of a Wagon Train to the Stars. At least those were bold new directions, though: for Voyager, the question was whether Trek was succumbing to rehashing TNG, and Enterprise was literally a backwards step in time - both were also criticised for catering to the lowest common denominator. The less said about the new films - and I've said far too much as it is - the better. So we come to Star Trek Discovery. Much like the new films, it's a reboot that's desperately pretending it isn't a reboot, but a perfectly faithful & compatible continuation of the Prime Timeline. Thing is, there's an incredibly easy way to reconcile Discovery with the Prime Timeline - you just have to change what you mean by that phrase.